"I’ve got my tree, I’m good here"
As far back in history as we can go, trees have represented the continuity of life. A tree sprouts, grows, branches out, and creates fruits or seeds that produce the next generation. When my first husband Jerome died in February 1986, I found comfort in watching the trees that had been dormant all winter come to life again the following spring. I’ve written several columns about trees - the ash tree at home that created a sense of stability as I recovered from a debilitating disease, the cedar tree planted by my grandfather and his mother on our family’s farm that provided a visible reminder of my family, and William Grimm's oak tree on the Kansas State University campus that pays respect to one of its graduates after his death in Operation Desert Storm. Brent said they picked an oak tree so that it would be around for many years. My mother, who was Stan’s loving companion after Jeanne’s death, was pleased when Stan, Brent and Teresa took her to see the tree in 2005. Both Mom and Stan are gone now, but the tree is still there and that, somehow, eases those losses. In 2003, daughter Katie’s close fourth-grade friend Logan died in a traffic accident. 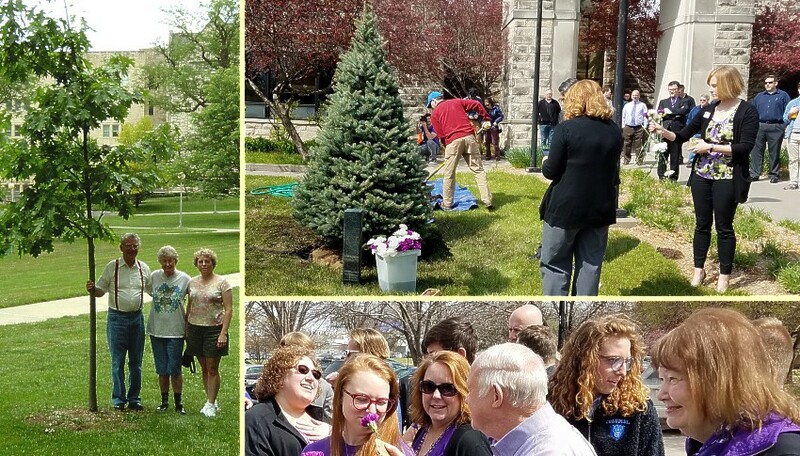 The planting of a tree in the school playground to honor Logan’s too-short life and keep her memory alive provided comfort to Katie and her classmates. A couple of weeks ago, I paused in front of a spruce near the entrance of Dole Hall on campus. I smiled and thought of friend Steve Logback, whose memorial service was one year ago today. He always seemed to have a positive attitude and always had time to stop and chat. The spruce was planted in his memory last spring. To me, the tree serves as a daily reminder of the service Steve provided to our university. I can see it from my office and know that it’s an enduring symbol. My practice is to stop every time I walk by, just for a second, to remember Steve. Can’t say what it means to other folks, but it’s a great way to honor a memory with a living reminder. Jeff said it’s good to be reminded what is important in life - friends and family - and to be sure other things don’t get in the way. Others have sometimes heard me refer to “my” gingko tree on the campus. It’s not really my tree, of course, but it shades my car from the hot summer sun and provides a beautiful yellow canopy in the autumn. So it struck me when Donna mentioned Steve was also a fan of shade trees. ... Steve always loved shade trees, searching them out whenever we were out in the open for too long under the hot sun ... he would pat whatever tree he had selected to sit under and explain, “I’ve got my tree, I’m good here.” He loved to take solace under its branches, and seemed to gain strength from their majesty, so it only seems fitting that we have a tree for him at his favorite place, K-State. ... I haven’t really been able to process all that this tree could mean for me yet, as I am still trying to process all the transition our family has endured over the last several months. But I do know that it makes me smile when I think about the tree being there, forever protecting that dedicated group of individuals who ensure K-State is well represented in the world. Whether they’re evergreens that maintain their color throughout the year or those that leaf out in the spring and summer, change to red and gold in the fall, and become dormant in the winter, trees give us protection and beauty. But perhaps their role as a visual reminder of the transient nature of an individual’s life, yet the enduring nature of life itself, is even more important. Left: Stan with hand on his tree, next to friend Edla Freeland (middle) and daughter-in-law Teresa; top-right: planting Fat Albert; bottom-right: (l-r) Logback's daughter Liz smells a purple carnation while wife Donna looks on. His father is holding the flower. Logback's son Logan is at the right of his grandfather and his aunt is at the extreme right. Other columns from 2018 may be found at: 2018 Index.